Explore Bangkok By Running – 5 Must Do Routes | JustRunLah! 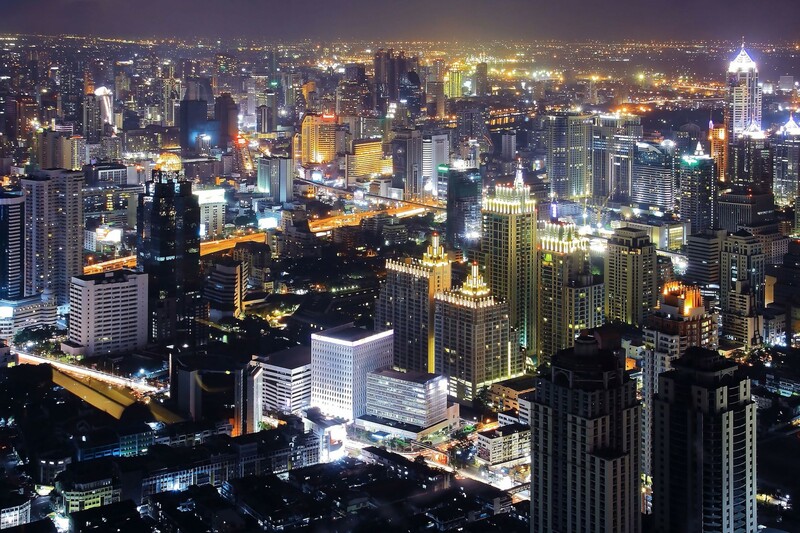 Bangkok is one of those countries I share a love-hate relationship with. 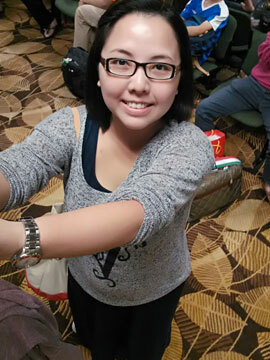 While the food and shopping there are to die for, the weather is so, darn, hot. I know it sounds weird coming from someone who was born and bred in a tropical country that knows no other weather except hot and humid, but you have to also know that Bangkok is usually a few degrees hotter and that makes a heck of a difference. Still, if you are there on holiday and wish to work off some of the extra calories but don’t happen to be staying in a hotel that has a gym, it’s not the end of the world. Here are 5 trails you can try out which will provide some shade and ensure a good workout at the same time. 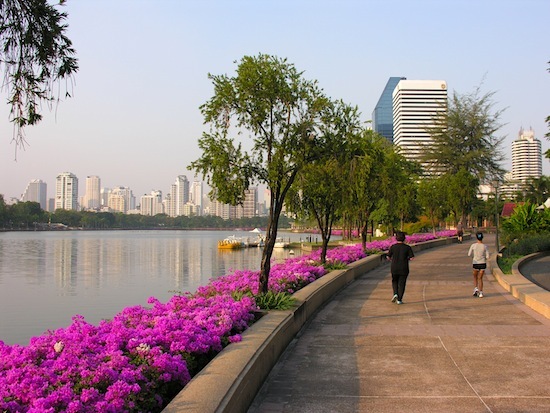 The name is well-known amongst locals and tourists alike and that is also a reason why Lumphini Park is so popular amongst the various groups for a morning or evening stroll, jog or Tai Chi session. 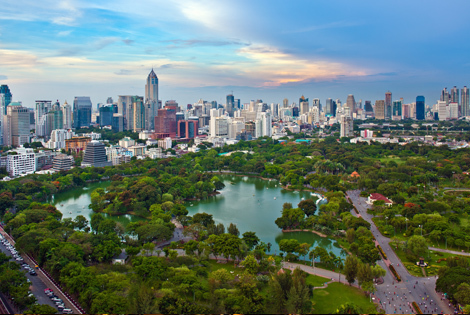 Located on Rama IV Road, across the road from Silom Road and Dusit Thani hotel, the park is wide open and provides plenty of shade, great for keeping cool, and is constantly filled with serious and avid runners. Besides not being very long (just about 2.5km for one lap), another plus point about this spot is that there are showers and lockers available for rent to keep your belongings. However, as busy as this park may be, it is highly recommended that you do not go at night for fear of robbery or any kind of assault that may happen. If you know about Chatuchak market, you will be able to locate this running spot. Quiet and spacious, this place is a favourite of the lower Lad Phrao office workers as there is plenty of shade from the trees and even a swimming pool. Spanning just about 3km per lap, this park also provides showers, lockers and even bikes to rent if you feel up for it. Do note that the weekends can get quite rowdy and crowded though and be very careful when you are on a run as the concrete pathways are often pretty uneven. You don’t want to be injured while on holiday would you? This is a place where the wealthy and beautiful congregate, it seems. And it is no wonder that this park is so easily accessible (just next to BTS Phrom Phong). Apparently, the crowd here is made up of Japanese expats and the rich and beautiful elite of Bangkok, which of course then makes it obvious that there are showers and lockers for rent to make sure you don’t look awkward and clumsy amongst the rest of the good-looking runners around you. The route isn’t long at all, only about 700m per lap, but it’s definitely a great place to people watch and maybe be on the lookout for a companion too. 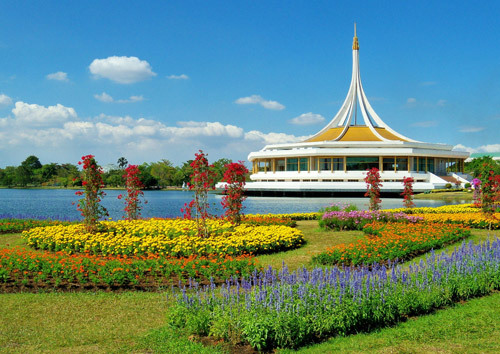 This park can be considered a more tranquil alternative to Lumphini Park since there is usually considerably less people and more picturesque. 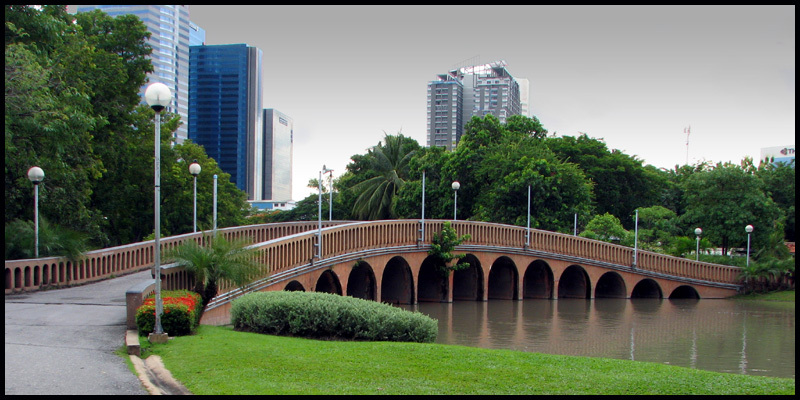 Located right next to Queen Sirikit Convention Centre and close to both BTS and MRT stations, Benjakitti Park is popular with people living and working around Asoke and Klong Toei. But while the 1.8km per lap trail is a good length for a run, there aren’t any showers or lockers for rent here so do come prepared with either as little as you can manage or a proper carrier to make sure you can run but still be comfortable with all your necessities on your back. Although not exactly located in the best of places, this park has its fair share of advantages still. For one, it is very, very spacious and has plenty of gardens of different shapes and sizes along the way for you to admire. Two, it is close to a Rod Fai Market which means you could do some shopping after your run before heading back to the hotel for a shower. And while the lap distance is pretty awesome, especially if you are looking to do a longer run, do note that there are no BTS or MRT to this place so if you want to check this place out, you have to be prepared to brave the horrendous Bangkok traffic. You might want to say “Bangkok is one of those cities…” instead of “…countries”. 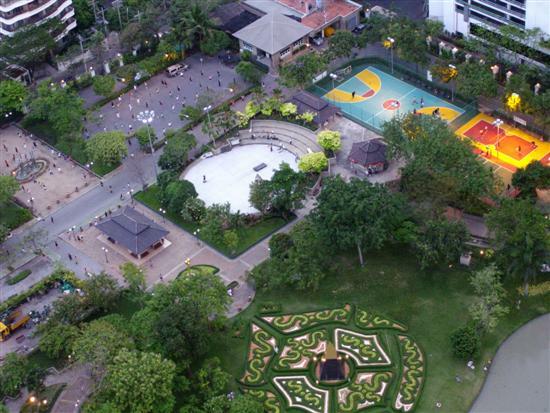 Regarding safety in Lumphini Park you don’t need to worry at nighttime – the park closes at 9pm. During opening hours there is plenty of police. Worth to mention is that every morning at 8 a.m. the national anthem is played all over the park through speakers and it is absolutely mandatory to freeze – whatever you are doing in that moment. There is some build-up announcement and countdown beeps during which you can go on, but at the end of the countdown you need to come to a dead stop.